Runnababez has picked Californian, Anielia Collete (formerly Tonkin) to be July’s feature Runnababe of the month! Runnababez feature of the month runners’ have completed goals & accomplishments that we would believe represent our slogan/motto of , “Fun. Fast. Fabulous.” They also motivate women to try and fit running into your daily lives! So, you too can reach for goals and feel fabulous & fit! If you don’t think you can commit, or don’t have the time, these ladies prove otherwise! Recently Anna has accomplished finishing her first half marathon. To start, Anna returned to the running scene after an absense after graduating college… (she use to run for Lindenwood University). While at Lindenwood she was a numerous National Track & Field qualifer. She has returned to fine form, and we had the chance to catch up with & interview her on her most recent accomplishments of completeing the grueling Ragnar Relays. She is now currently training for her first Marathon coming up next month in San Francisco! 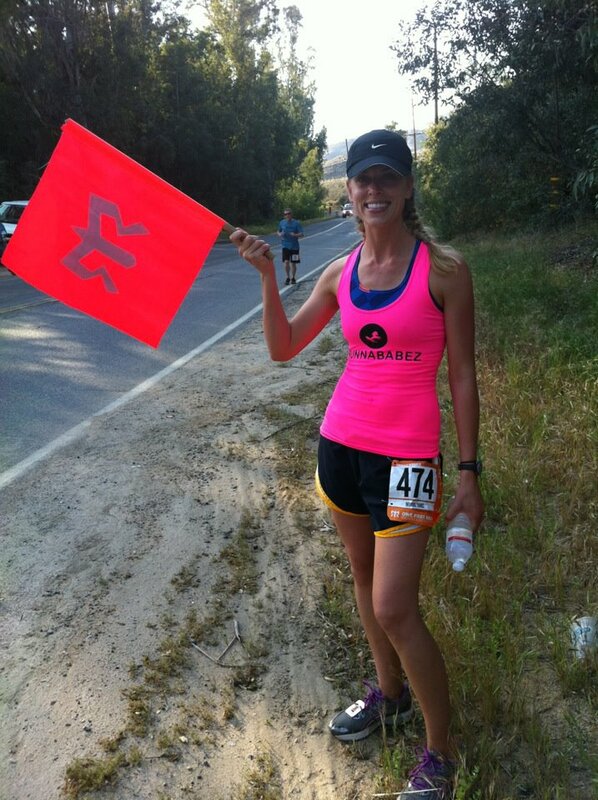 Congrats to Anna on her latest running accomplishments & her newly wed status! Read below to learn more on how Anna makes running a part of her life all the while, being fun. fast. & most of all fabulous! RB (Runnababez) : Tell Runnabez about your running background? How did you get into running?Anna: I have always been very athletic playing every sport under the sun growing up. As I got older Soccer became “my sport” As a freshman in high school the cross country coach saw me on the soccer field during summer league and recruited me to run on his team. I ran local 5k’s growing up but never thought about competing in high school. To my surprise the sport of running came very natural to me and before I knew it I was running Varsity cross country all 4 years. As a freshman and sophomore I loved distance running. By junior year the 800m race became my main event and distance running no longer came as easy and was now something I had to work harder to be good at. Either way I LOVED the feeling a completing a race or tough workout. RB: Walk us through a day in the life of Anna Tonkin, soon to be Collette! How and when do you fit running into your day? Anna:First and foremost I have to remind myself that someone who is busier than me is out running right now. Bottom line is that there truly are no excuses! The time you waste making another excuse is time spent that you could have been training and chasing dreams. Fitting running into my day is not always easy. For me the toughest part of running is that first step out the front door. I love love LOVE the feeling and high I get after a good run but find myself to be the absolute worst procrastinator you can imagine!! I am currently working with moderate to severe special Ed children. While I love what I do I come home tired (like most other people do with any other job) I get home and have dinner to cook, errands to run, and a son who is in need of a long walk or some one on one play time. (A 95lb Labrador Retriever mix named Spud) While he was my primary motivation to run I have come to find it is simply too much for his joints and he doesn’t last more than 2 miles running with me. With this said it has been a little bit more of a challenge fitting in both a run for myself and a good long walk for Spud. I run in the evenings and on the weekends, first thing in the morning. My favorite time to run is early to beat the heat but on week days it doesn’t always happen due to my procrastinating ways of hitting the snooze button and not being able to get out of bed early enough to fit in a run! A happy Anna running along in the Ragnar Relays! RB: What motivates you to run? 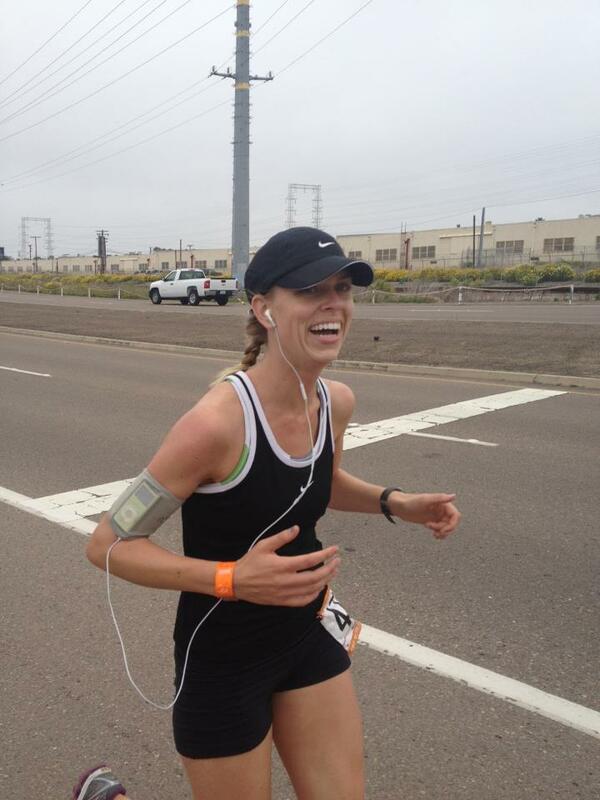 Anna: Friends and other runners motivate me to run. I LOVE reading running blogs and inspirational running quotes. It also helps me to surround myself with active, positive people who all have the same or very similar goals to mine. The biggest motivator though is truly to be around people who lift you up not those who bring a negative lite and drag you down. Bottom line is, today I do what others don’t so tomorrow I can do what others can’t. 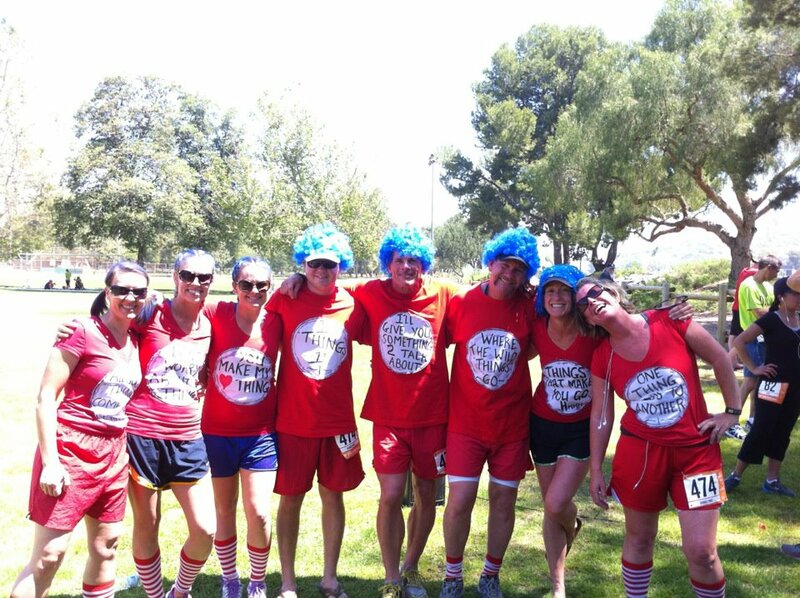 RB: You recently completed a 200+ mile Ragnar Relay running event in Southern California, tell us more about it? How was it sleeping on the side of the road? What was going through your mind while running? Anna: Let me start out by saying this race was way out of my comfort zone. For anyone who knows me well knows how paranoid I am before not only any big race but for even any tough workouts. My anxiety levels exceed the normal human beings. Many people wonder why I continue to run and compete if I am so miserable and anxious before each and every event. My answer would simply be that the runner’s high I get out of it is just worth what I deal with leading up to it. Ragnar was tough. I ran on a team of 12 runners. We had different levels of talent on our Co-ed team. This was my first year doing the race and hoestly I was sucked into it! My friend basically signed me up and then told me I owed her the $120.00 entry fee and that this whole experience “would be fun”. I nearly died right then and there. But again, I could have refused to pay and not done Ragnar but instead I felt like “well, I’m signed up, I guess I better start training…” And so it happened… I ran 3 legs over the course of 24 hours. While many may think that my total mileage of 17 miles wasn’t very much the challenge came with not having much recovery time, quality sleep, good meals or most importantly for my OCD self, NO SHOWER! You see I love to shower, have a fresh clean outfit and have my hair braided nicely before each and every race. I had to change my ways and adapt and I think this race turned out to be the best thing for me! My first leg was miserable. I clearly remember cursing to myself and asking myself why I got myself into this mess in the first place. It was 104 degrees outside and I was running at 4:30 in the afternoon. The sun was beating down on my face and I could feel the burn with each step I took on the back of my calves. My other thoughts going through my head was the fact that I was getting married in 5 weeks and how that sun was going to give me a terrible sports bra tan that would look hideous with my strapless, elegant wedding gown. The things I think of.. I know… At this point runners were dropping like flies. There were no water stations, your only support was your team who would do their best to drive ahead in the van and meet you at different points. People were completely out of water and my team as well as a few others were handing out bottles of water of water ever they had left. The day turned into night and teams pulled out the head lamps and reflective gear. While I dreaded the night runs from the day I committed myself up until this point I suddenly felt differently. I was excited and pumped up. The weather was cool in the low 60’s and for me my dream running weather. We had 5-6 hours of down time at this point while our other van of 6 runners ran their legs. During this down time we stopped to fill up our van with gas, went to Marie Calandar’s for have a baby wipe bath in the restrooms and change, and eat a good hearty meal that would have to ultimately hold us over until we completed the race at 4:00 the next evening. After getting all of these things done we drove to the next checkpoint and parked the van. There were hundreds of other Ragnarians doing the same thing. People were sleeping all snuggled together in their vans, sleeping in sleeping bags on the sid of the roads, sleeping in sleeping bags on the lawn at a park, etc.. In simple terms it was survival of the fittest. People were doing whatever they had to do to prepare themselves for their next leg. After finally falling asleep for about 30 minutes we get a phone call from van 1 that their last runner will be running into our checkpoint in the next 15 minutes. 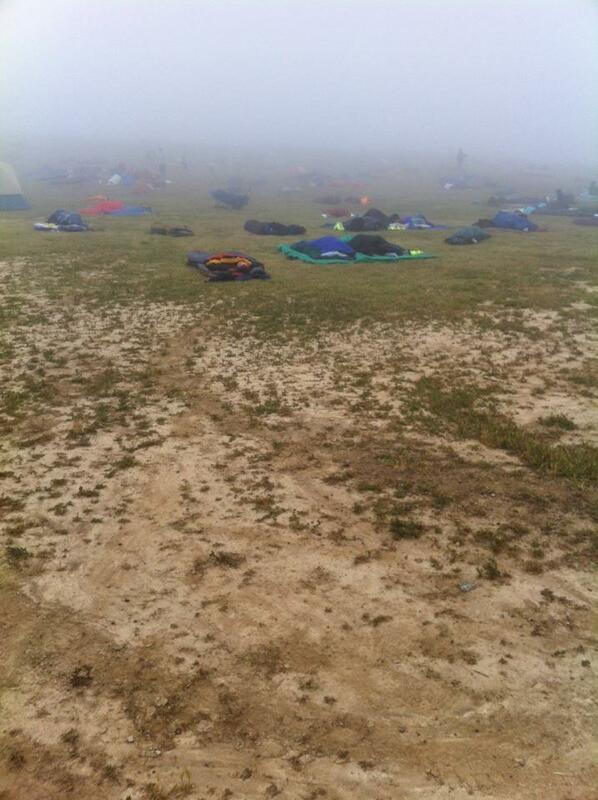 We jump up, pack our stuff and head to the checkpoint hand-off. I jump in as my runner approaches and he slaps the neon wrist brand on my wrist. I am off and feeling fab at 3:00am. It is quiet as runners are staggered throughout the entire race. When you sign your team up for the race you have to submit a time of pace that you project each runner will run. Start times for each team varies based on these projected times. There were points during my 3 legs when I was running all alone hearing nothing but my feet hitting the pavement one step in front of the other. During these times I did a lot of thinking and self reflecting. I felt proud that I was doing something that I normally wouldn’t feel comfortable doing. I felt proud that I was pushing myself to compete to the best of my ability. 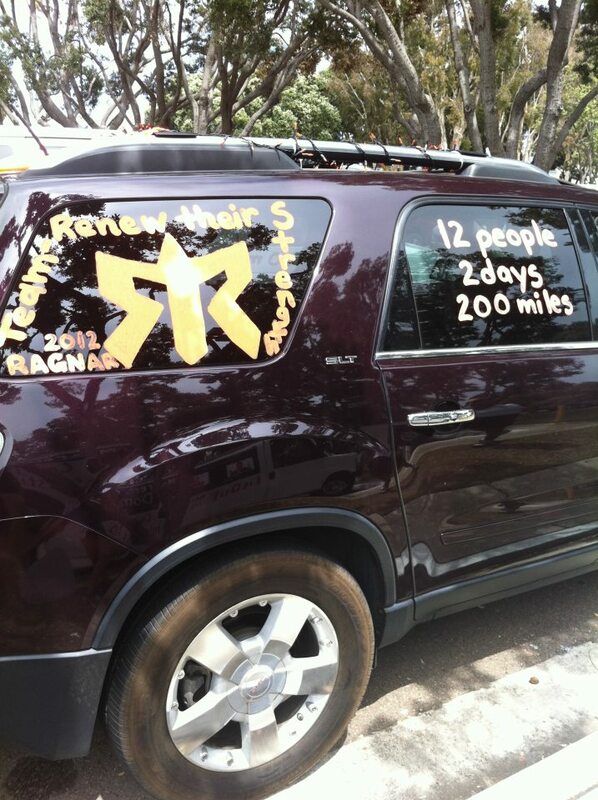 I felt proud and inspired by these other hundreds of Ragnarians out here doing the very same thing I was accomplishing goals and chasing down dreams. RB: Why did you decide to take part in this event? I really didn’t. Peer pressure got the best of me. I am so grateful someone gave me this push because the feeling of accomplishment when I was done was far greater than the feeling of doing nothing at all would have felt. RB: How long did your runner’s high last after this racing accomplishment? Anna: A good week. I felt a strong runners high for 3 days following the race but I was thinking about my next potential Ragnar experience and trying to recruit people to make a team for next year that whole week following the race. I was on the top of the world and couldn’t believe I accomplished such a big race. For me my biggest enemy is my mind so completing a race of any sort always surprises me because I guess I never think I can actually do it in the first place? RB: What race is up next on your plate? Anna: The San Francisco Marathon on July 29th!! This is a life long dream to run and complete a marathon. Again, I am in disbelief that I have even signed up but so excited to accomplish another dream and aspiration on my bucket list. I got married June 9th 2012 and this will be my FIRST race as a Collette. It will be a very emotional a symbolic experience to say the least. RB: What running advice would you give to a “new runnababy,” aka someone new to running? Anna: No matter how slow you are, you are STILL lapping everyone on the couch. Please, please remember, whether it is a 14 minute mile or a 7 minute mile, it is still a mile so get out, run and be proud of yourself for taking the steps and effort to do anything at all. It is NOT easy and natural for everyone to run. Like everything in life somethings certain people need to work harder at than others but I promise you, it is all worth it when you step over that finish line whether it be a 5k, 10k or a full marathon. Chase your Dreams, one step at a time. RB: Runnababez believe in having fun, being the fastest you can be, all the while being FABULOUS…All of which you exemplify! What do you love most about running? Anna: Feeling accomplished, feeling healthy, having more energy which all result in an overall great lifestyle. RB: Thank you Anna for your time to share with us your accomplishments and how you make running work for you and your life! We wish you the best in your upcoming San Francisco Marathon! Wow! What an inspiration this girl is!